The rate of development in technology is such that our lives are changing more rapidly than at any previous time in history. As educators, it is our responsibility to ensure that we prepare our students to participate in a society that will look vastly different to today. Our challenge is to prepare the children of today for a world that has yet to be created, for jobs yet to be invented and for technologies yet unknown. The current generations of children are growing up with knowledge of, access to and an expectation that technology will be central to all they do. Having access to such technology (and therefore, immediate access to information) is no longer a luxury or extravagance, but an expected part of the lives of today’s children. Success Primary School is seeking to address the challenges outlined above by implementing a 1:1 iPad program in 2019 for our Pre-primary to Year 6 students. 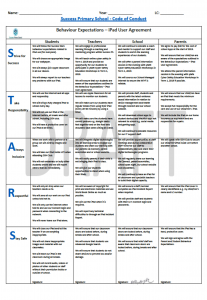 For the program to work effectively, it is important that the iPad selected complies with the minimum specification outlined in this document to ensure the iPad is suitable for the learning task, is convenient and portable and most importantly, is adequately backed up by a rapid repair service in the event of a problem. 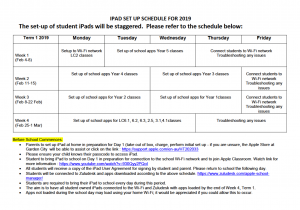 Below are our copies of our iPad User Agreement and iPad Set up Schedule for 2019.